Welcome to the Little Acorn Patch Kindergarten Program! Your child is about to begin a new adventure. Beginning kindergarten is an exciting time for your family, and we look forward to our part in that adventure. Our program provides a period of transition for the five-year-old child from the informal learning in the home. Our primary focus is providing instruction to each student at his/her stage of development. This is accomplished by integrating the skills and understanding of all subject areas and by providing for differentiated instruction, based on the needs of the students. Many manipulative and hands-on experiences are included in the program to ensure that it is developmentally consistent with the way in which five-year-olds learn best. 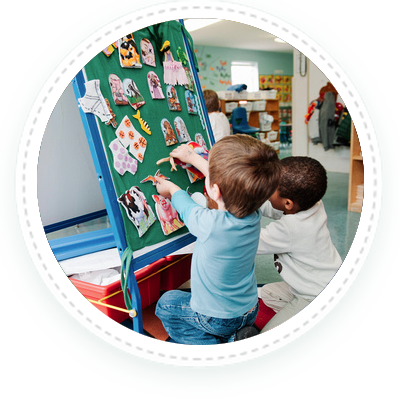 Our kindergarten program, accredited by the Commonwealth of Virginia and additionally accredited by the NAEYC, provides 180 instructional sessions. The instruction begins at 9:00 a.m. and continues until 3:00 p.m. with a break for lunch and a short rest period. We follow state guidelines regarding age, to allow for easy transition into the Fairfax County Public School system. Included in the kindergarten program is a phonics based beginning reading curriculum, creative arts, social studies, science, math, language arts, music, and creative movement. A graduation program is held at the end of the school year. Parents will be provided educational records for hand delivery to their child’s first grade Teacher. Working together, we will continue to nurture your child’s curiosity and natural wonder for the world and all of its opportunities. You may anticipate a year of great wonder, enthusiasm, and engagement as your child meets new friends and enjoys a wide variety of learning experiences in a fun atmosphere!